Of the Hellespont, Leander swims to me. Sinkt die Sonne schnell auf Höhe Tintenspiegel. Die Spitzen ihrer Schnäbel laufen blassgrün an. Möwen schippern auf einem abgetriebenen Floß. Brech ich auf jetzt oder ab mit dem Meer? Zu mir: vom Hellespont der Heftklammer aus. Thomas McCarthy was born in 1954 in Cappoquin/ Ireland. He is a poet, novelist and literary critic. He attended the University College Cork. There he took, inspired by John Montague, part in the revival of literary activities. 1978/1979 he was a Fellow of the International Writing Program at the University of Iowa. In the publishing Anvil Press Poetry, London, he has published seven volumes of poetry, including 'The Sorrow Garden', “The Lost Province”, “Mr Dineen’s Careful Parade”, “The Last Geraldine Officer” and “Merchant Prince”. McCarthy has also published two novels, 'Without Power' and 'Asya and Christine.' 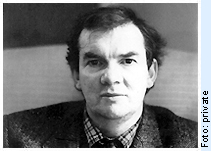 In 1977 he won the Patrick Kavanagh Poetry Award.